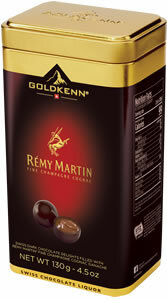 Sugar, cocoa mass, Remy Martin cognac 11%, cocoa butter, water, glucose syrup, emulsifier (SOYA lecithin), vanilla. May contain traces of milk, hazelnuts, almonds, eggs, gluten, peanuts. Cocoa: 54% min. in chocolate.